Matthijs de Ligt (file pic). De Ligt, 19, is already linked to some of Europe’s biggest clubs, including Koeman’s former side Barcelona. Manchester City are also said to be interested while Bayern have also been linked with the young star. 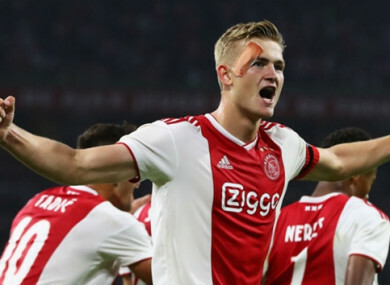 Koeman believes De Ligt, already a 13-time Netherlands international, is on track to be the world’s best. “De Ligt and [Frenkie] de Jong are special for various reasons,” he told Catalunya Radio. “De Ligt is younger, 19, and plays in an important position, as a centre-back. “He’s the Ajax captain and from their school. That is to say Barca’s school, because it means that he has a lot of technical quality and tactical nous. Ajax currently trail PSV by two points in the Eredivisie through 17 matches, with both teams having lost just once in league play. Next up for Ajax is a meeting with Heerenveen on Sunday, before a rematch against the same opponent in cup play on Thursday. Email “'He will be the best centre-back in the world in two years'”. Feedback on “'He will be the best centre-back in the world in two years'”.